The Ibrox boss said Nottingham Forest will not recall the central defender this month. Rangers boss Steven Gerrard has confirmed that Joe Worrall will not be recalled by Nottingham Forest this month. Worrall moved to Ibrox at the end of the summer transfer window on loan from the English Championship club and has since made 11 appearances for Rangers, including the 1-0 victory over Celtic before the winter break. The centre-back moved to Glasgow on a season-long loan but following a change of manager at the City Ground, where Martin O'Neill has taken charge, there was speculation that Worrall could be recalled. 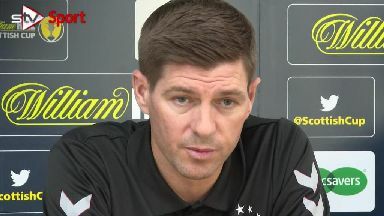 Gerrard has said that he has spoken with Forest and that that the 22-year-old will be staying at Ibrox until the summer. "We've spoken to Nottingham Forest," he said. "I think in the deal they had up until January 7 to call Joe back and we never heard anything so Joe will remain until the end of the season. "He's a player who has done really, really well for us. I thought he was excellent in the Old Firm game. So he'll stay with us. "Forest haven't made any request. They've just been on to check how Joe is doing and they've said that they've been really happy with the job we've done with him. So that was nice to hear." The Rangers boss revealed that Jordan Rossiter, who has suffered with injuries in his time at the club, could now be put out on loan to get game time after regaining full fitness. Dundee United have been linked with a move for the former Liverpool midfielder. However, Gerrard said there was no prospect of Ross McCrorie being allowed to leave on loan this month. He also confirmed that January signings Steven Davis and Jermain Defoe will feature at some point in the Scottish Cup tie against Cowdenbeath on Friday evening.